Adding the word "California" to a recipe title somehow brings avocado to my mind, and after my recent visit to the California Avocado Country, just about all of my recipes are being California-ized. Take, for example, the simple Greek Salad. Last year while in Italy, Greek Salads seemed to be on nearly every Roman menu. Hence, lunches and dinners frequently included varying versions of the lemony goodness as my fondness grew with each variation. However, none of these traditional salads included avocado. None of the traditional salads included quinoa either, another somewhat California addition. With both ingredients, avocado and quinoa, on hand this afternoon, they soon combined with a lemon from my tree, a can of garbanzo beans (chickpeas), red onion and a splash of olive oil for a delightful light lunch. Protein-rich, the lunch is helping me work on my swimsuit figure which will need to be ready in about a month and a half as we head to Liv's National Competitions in sultry Las Vegas. This is the type of salad that I love... one of those versatile salads that works well with what you have on hand. The only ingredients that I measure precisely when making this dish are the dry quinoa and water. The other ingredients are more of "a little of this" and "a little of that." Cucumber also makes a wonderful addition. Pick and choose what works for you to create a salad of your own! In a small saucepan add the 1 cup of water and the 1/2 cup of quinoa. Bring to a boil then reduce the heat and simmer, covered, until the liquid has been absorbed (about 15 minutes). Set aside to cool. In a medium bowl combine the cherry tomatoes, red onion, chickpeas and avocado. Squeeze a wedge of lemon over the top and drizzle with olive oil. Salt to taste, but salting lightly if you will be using the crumbled feta. Stir gently to combine. Add the quinoa, stirring gently again to combine. Spoon onto serving plates and top with crumbled feta. Enjoy! 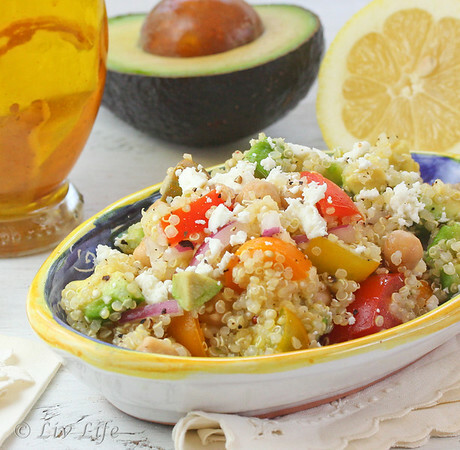 I love adding quinoa to salads and need to pick up a few avocados for the weekend! Your salad looks like a delicious combination of flavors, colors and textures. I could easily become distracted from going to the gym with a bowl of this in front of me! 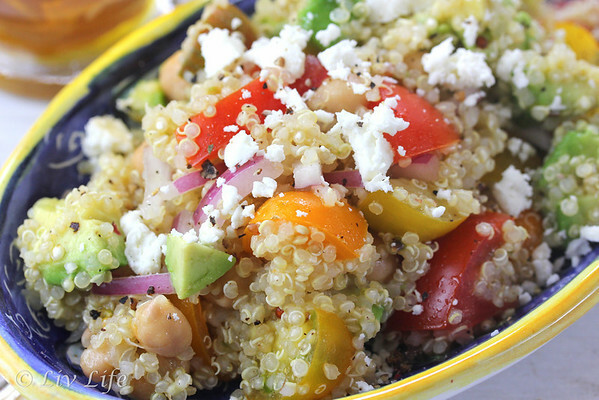 I love quinoa salads and this one is especially colorful! What a healthy, refreshiing and vibrant salad! I just saw Laura (Family Spice)'s post about the Calif Avocado Country. We're lucky to be in California to enjoy fresh avocados and veggies/fruits. 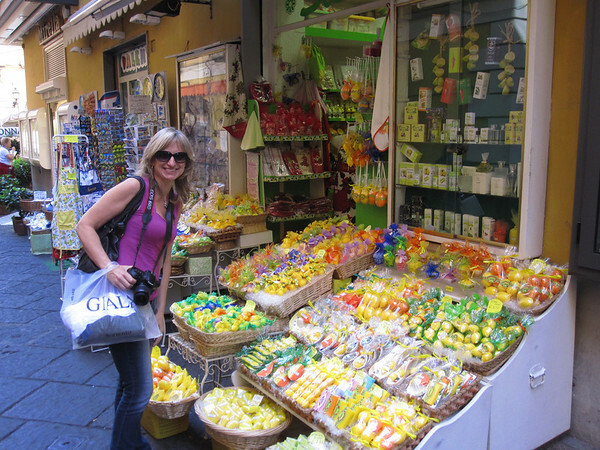 Love the picture of you in Italy! what a beautiful,healthy and colourful salad,sound yummy with all great ingredients in it !! Kim, this sounds like the perfect lunch to me, fresh, healthy and delicious! What a beautiful salad! Such yummy (and colorful) ingredients! 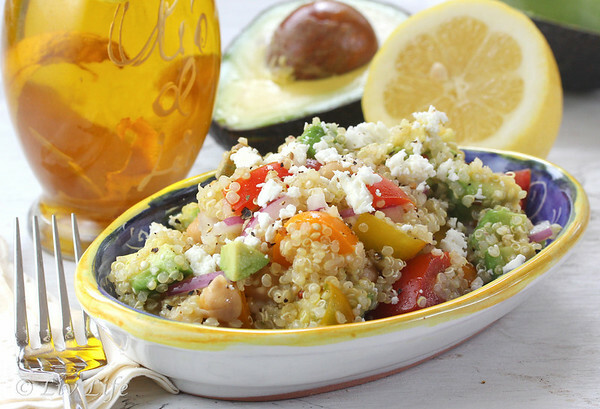 I love Greek salads but adding the quinoa and avocado turns it from a salad into a full lunch. Great idea! I found you on A Little Bit of Everything. This salad is right up my alley, thank you!